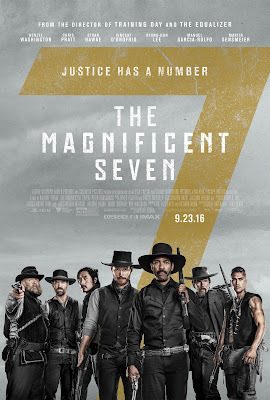 Director Antoine Fuqua's remake of the classic 1960 western, of the same name; which was in turn a remake of the 1954 Japanese epic 'SEVEN SAMURAI'. It once again tells the story of seven outcast gunmen, that band together to defend a poor town from a ruthless industrialist. The script was written by Richard Wenk (a veteran action film director, of movies like 'THE EXPENDABLES 2' and 'THE EQUALIZER') and Nic Pizzolatto (who also created the popular TV series 'TRUE DETECTIVE', and wrote all of it's episodes); it's based on a screenplay by the great Akira Kurosawa, Shinobu Hashimoto and Hideo Oguni. The film stars Denzel Washington (in his third collaboration with Fuqua), Chris Pratt, Ethan Hawke (in his third collaboration with Fuqua as well), Byung-hun Lee, Manuel Garcia-Rulfo, Vincent D'Onofrio, Martin Sensmeier, Haley Bennett and Peter Sarsgaard. It's received mostly positive reviews from critics (although not great ones) and it's done pretty well at the Box Office (but not great). I think it's a fairly good western remake (but not a great one). The movie is set in 1879, in a small mining town called Rose Creek. The town is taken over by a corrupt businessman, named Bartholomew Bogue (Sarsgaard), and his men; and when some of the townspeople try standing up against him, they're slaughtered. Emma Cullen (Bennett), who's husband (Matt Bomer) was murdered, rides to the closest town, with her friend Teddy Q (Luke Grimes), looking for help. They're they meet a warrant officer named Sam Chisolm (Washington). When Cullen offers Chisolm a lot of money, and informs him that Bogue is the culprit, he reluctantly agrees to help her. Chisolm then sets out in finding six other gunmen to help him. The movie is entertaining, full of colorful characters (and good performances), and it also has some pretty spectacular actions scenes; one shootout is really intense (and well done). The movie is definitely entertaining; there's a few slow moments, but there's not too much really to complain about. Still, despite all it's strengths, it left me wanting a little more. It's definitely not a classic, like either of the films it's based on (or 'THREE AMIGOS'), but it is a pretty good western flick.